Citation Information: JCI Insight. 2019;4(7):e127239. https://doi.org/10.1172/jci.insight.127239. Lack of CD91 on DCs abrogates immunosurveillance of cancer. (A) Schematic for generating mice with a deficiency of CD91 in DCs. 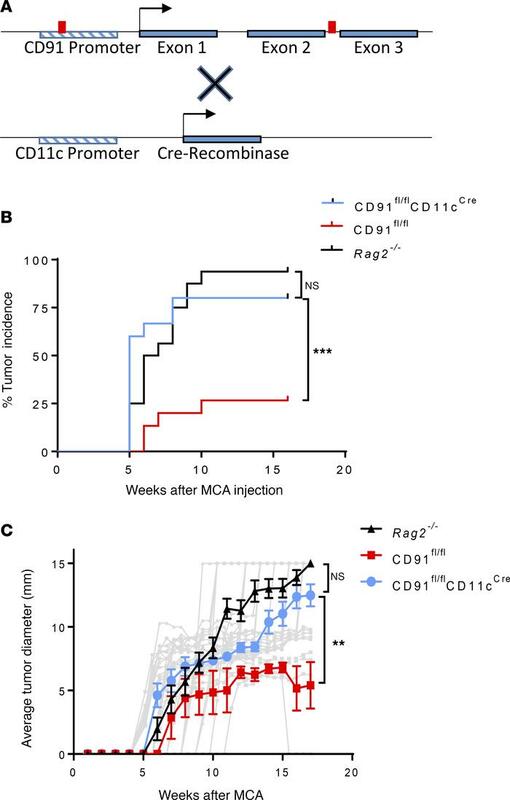 (B) Mice deficient in CD91 expression in CD11c cells (CD91fl/flCD11cCre, n = 13) were inoculated with a single dose of MCA s.c. WT littermates (CD91fl/fl, n = 15) or Rag2–/– (n = 15) mice were similarly inoculated. Mice were monitored 3 times a week for the appearance of palpable tumors. Tumor incidence is identified as tumors greater than 2 mm in diameter in any axis. P values were obtained by Gehan-Breslow-Wilcoxon text. (C) Tumors that grew in any mice (n = 11, 4, and 14 for CD91fl/flCD11cCre, CD91fl/fl, and Rag2–/– mice, respectively) were measured. Growth curves for individual mice are shown in gray with the same group symbol. P values were obtained by 1-way ANOVA analysis of comparisons of area under the curve for each group. **P < 0.01, ***P < 0.001.